Deborah “Atianne” Wilson is excited about holding a space of love and wisdom, along with her trademark Angelic Booty-Kicking, for you every Wednesday at 10 a.m. MT, where she honors the Truth that Spirituality AND Wealth are intertwined entities. Are you keeping them separate? Yes, we’re talking money, but that’s not complete wealth; we want to get you thinking differently and invite you to shift your mindset around what is prosperity and what is wealth and how they are woven together. The essence of Deborah’s show is being more playful about the ideas of Spirituality AND Wealth and not taking ourselves so seriously. Deborah prides herself on supporting you through a raw, authentic and tell-it-like-it-is approach. Deborah will offer you practical spiritual tools and guidance through a mix of show formats. At times, she will sprinkle in interviews with other experts in the field of Spirituality AND Wealth, as well as guest hosts when she travels. 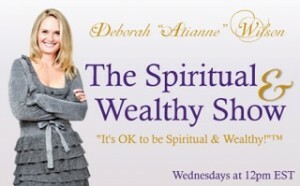 One of Deborah’s favorite things to do on air is provide intuitive coaching for her callers on health, wealth, spirituality and relationships. Join Deborah for playful, practical, bottom-line, cutting-to-the-chase, cutting-edge wisdom to co-create the life you want and the life that is your birthright as you take responsibility for your Spiritual AND Wealthy life. 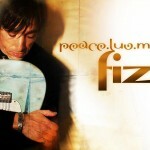 Shout out and much love and gratitude to Fiz, whose music was selected among many choices to be featured during my show. So appreciate this talented artist’s work on this planet and his beautiful words: “I have always associated rock and roll with healing the world and playing a part of it. It was never separate. Use the following player to click and listen to one of Deborah’s radio shows. Or, click here to visit her main radio show page. Listen to my radio show podcasts on iTunes. but Listen to My Archived Shows! While my BlogTalkRadio show has been completed, you may still access my archived shows at this link here; enjoy my interviews, meditations, and angel messages and free readings! I had so much fun sharing stories and wisdom and whatever the Spiritual Realm guided me to do! You can listen from a large selection of my shows via the archive. Free downloads of all my radio show podcasts since my first show on 9-9-09. I often guest star live on the Mantz & Mitchell show in Seattle. I have been a featured guest on Seattle Radio’s The Mantz and Mitchell Show. Keep an eye out for upcoming episodes where I will make an appearance. 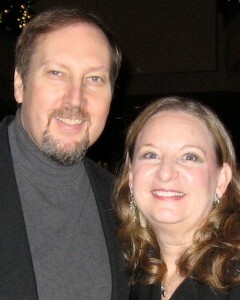 Gary and Suzanne’s show is every Friday from 10am-11am Pacific Time, and every Saturday from 11am-1pm Pacific Time. You can listen live on KKNW 1150 AM and if you’d like to ask a question, the call in number is 425.373.5527. Visit Gary and Suzanne’s website.